KPPU and Ministry of Health initiates formal cooperation in health. 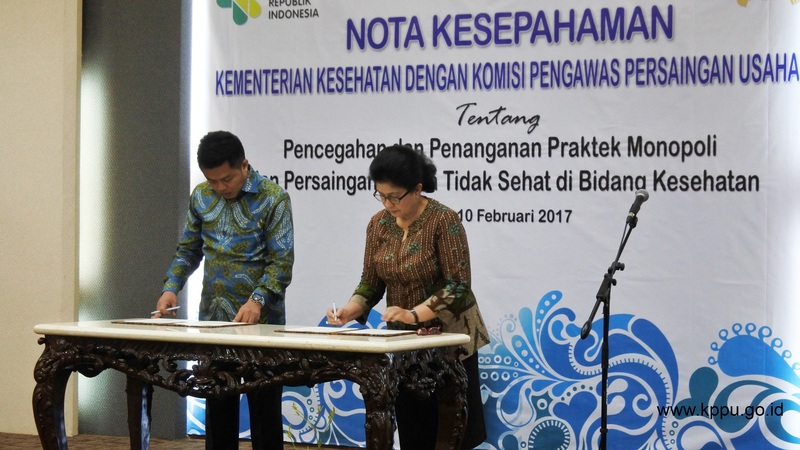 Indonesia’s competition commission, KPPU, signed a Memorandum of Understanding (MOU) with the Ministry of Health in 10 February 2017 to prevent and enforce monopolistic practices and unfair competition at the Ministry’s office in Kuningan area, Jakarta. The signing was attended by Chairman of KPPU and Ministry of Health, H.E., Nila Fair Moeloek, accompanied by top level officials of each institution. “KPPU put hope through this MOU, both institutions can joint hand in overcoming unfair competition practices in the health industry”, stated Chairman of KPPU, M. Syarkawi Rauf. In response, Minister of Health thought that both institutions shall cooperate in making better Indonesia. “It is important to have common understanding and strong cooperation by each jurisdiction through this MOU”, stated Minister Nila. The MOU consisted matter related to competition policy harmonization and coordination, outreach activities in educating fair competition and regulation in health, and assistance in providing resources person and expert on relevant matters. Both institutions appointed their Secretary General as focal point to implement the MOU for the next 5 (five) years.